Mars Orbiter Mission satellite has been lifted from Sriharikota Space Center of India in Andhra Pradesh according to time Schedule on 5th November,2013. A PSLV C-25 rocket will take it to the red planet and the satellite will be operational after September,2014. 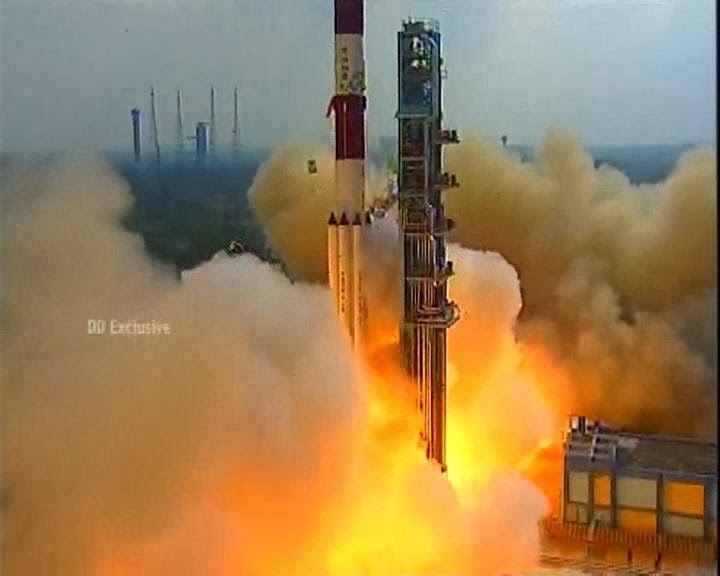 Instead of 15 surveillance instruments as per original plan of the Mission Mars, the satellite is carrying 5 instruments for collection of data and survey of specific areas of the planet.This change has been introduced by the Mission Authority to match convenient time and to avoid delay of the launch to 2016, a report says. Two thousand scientists of ISRO from 27 centers are now busy to monitor the Mars Orbiter from different parts of the country. The satellite, when operational, will search for life/ possibility of earlier life in the dusty red planet. Jet Propulsion Lab of NASA, European Space Agency and Japanese Aerospace Exploration are helping the Mars Orbiter Mission of India. UPdate: Six days after successful launch of the Mars Orbiter, the rocket carrying the satellite has failed to position itself on the scheduled orbital path one lakh km. above earth surface on Sunday night. Disturbance in the flow of liquid fuel to the engine has led to the failure to raise the apogee to one lakh km., sources said. However, ISRO scientists will carry out a supplementary orbit raising mechanism to lift the rocket from present 78,276km. to 100,000km. at 5am on Tuesday. Update : Mars Orbiter Mission ( MOM) ) was raised to 1 lakh km. apogee on 16th November,2013. It was final orbit-raising exercise of the MOM before its 300-day journey to the Red Planet starting on December 01, 2013. During the next two weeks the spacecraft will gain velocity to travel through gravitational fields of the Earth (upto 1 million km. ) and the Sun ( up to 600 million km. ), until it enters gravity fields of Mars on scheduled 24th September,2014, according to ISRO sources.